Back Row: Billy Geddes, Hector MacDonald, David Ross, Melvin Forsythe, Who?, Hamish Allen, Who?, Who?, Who? Middle Row: Who?, Hamish MacKay, Who?, Who?, Mary Campbell, Anne James, Dorothy Peaston, Who?, Who?, Who?, Mary Murdoch, Who?, Sheila MacKinnon, Who? Who? Front Row: Who?, Margaret ?, Anne ?, Who?, Pat ?, Who?, Who?, Kay ?, Sandra ?, Margaret Ross, Margaret MacLean, L. Auchterlonie, Who?, Who?, L. Auchterlonie. Back row in between Melvyn Forsyth and Hamish Allen is Donald ?. He lived in Saltburn I think. Middle row, girl 8th from left next to Dorothy Peaston is Ishbel (MacBain). Middle row, girl 6th from right next to Mary Murdoch is Dorothy Swanson. Front row, girl 2nd from left is Margaret Clayton. Front row, girl 4th from left is Gillian Munro. Front row, girl 3rd from right is Sheila Oag. 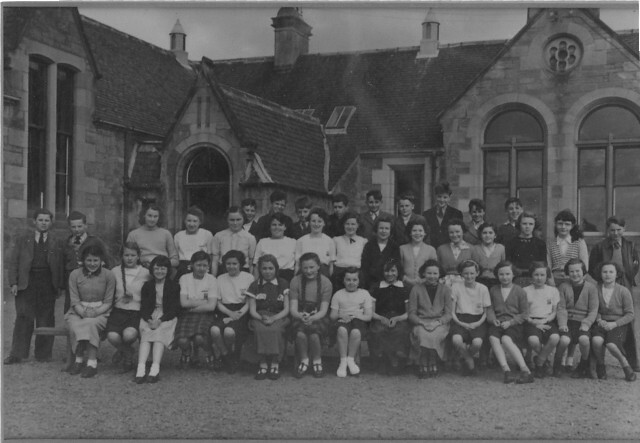 Front row, girl 2nd from right is Christine Pirie. The girl sitting next to Margaret Ross in the front row is Sandra MacCombie. Great website which I have just discovered. Missing names? Back Row last 3 on right Donald McDonald, John McIver, Bertie Cameron. Middle row on left Samuel Kennedy. Joan McKenzie 4th from right next to Mary Murdoch. Front row 6th from left is Alice ? And next to her is Agnes Reid. Not sure but next to Agnes may be Muriel Ward. Melvyn Forsyth is my father, living in Belgium right now.